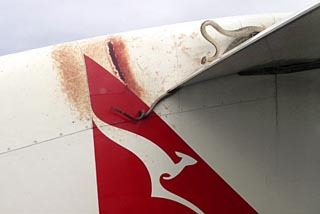 A 10 ft (3 m) scrub python was battling to retain its grip on the wing as a Qantas plane made its way between the Australian town of Cairns and Port Moresby in Papua New Guinea. It held on the whole 1hr 50 min flight. But on arrival in Port Moresby, ground crew found the snake had died. Passengers first became aware of the reptile 20 minutes after take-off. A woman pointed out the python to fellow passengers and cabin crew. At first only its head was visible, but as it tried to manoeuvre itself back to safety, its whole body was exposed. Time and again it tried to pull itself back into the shelter of the wing, but the wind was relentless. The wind speed was 250 mph (400 km/h) and the temperature -12C. The snake’s body was hammered against the engine, leaving blood stains on the white paint. One passenger, Robert Weber, a website designer in Cairns, told the Sydney Morning Herald: ”The people at the front were oblivious to what was going on but the passengers at the back were all totally focused on the snake and how it might have got on to the aircraft. Scrub pythons are Australia’s longest snakes. They feed on rodents and often conceal themselves in enclosed space to ambush their prey. The wing of a stationary aircraft may have appeared a likely place to this particular snake.